Responsive Email Template Builder: Build The Perfect Email! How about if your sent emails get automatically optimized according to recipients viewing environment.? It is possible to design perfect responsive emails..
..automatically resized according to the viewing device like smartphones, tablets, etc. And So, MailGet provides responsive email builder through which you can create beautiful and stunning emails. It just requires a few clicks, and your email is ready..!! 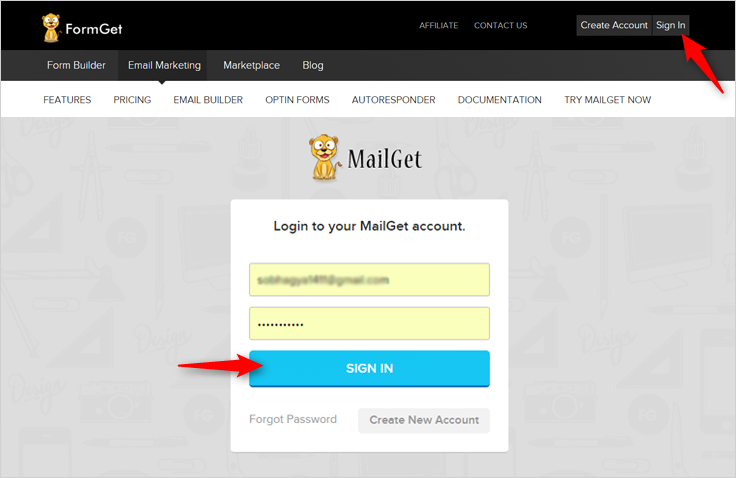 Login to your MailGet Account..
..you will be redirected to MailGet dashboard. 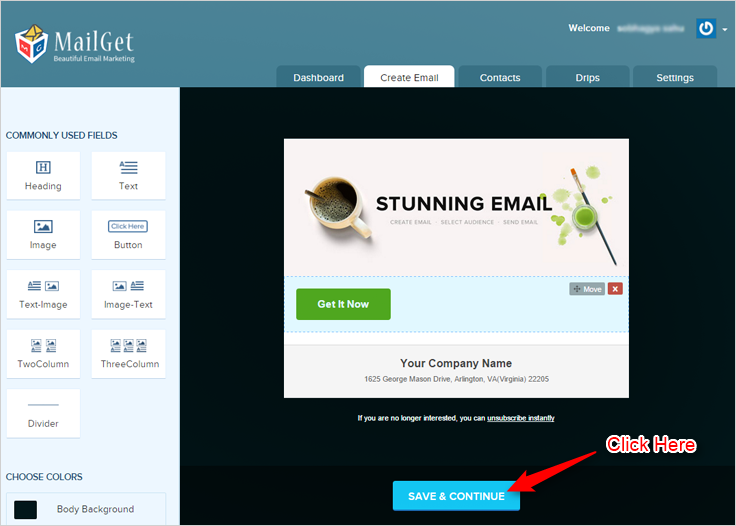 As soon as you enter into the MailGet dashboard..
..click on CREATE EMAIL button i.e. the first step of creating an email. After clicking on CREATE EMAIL button..
..you will find various email editors for creating emails. 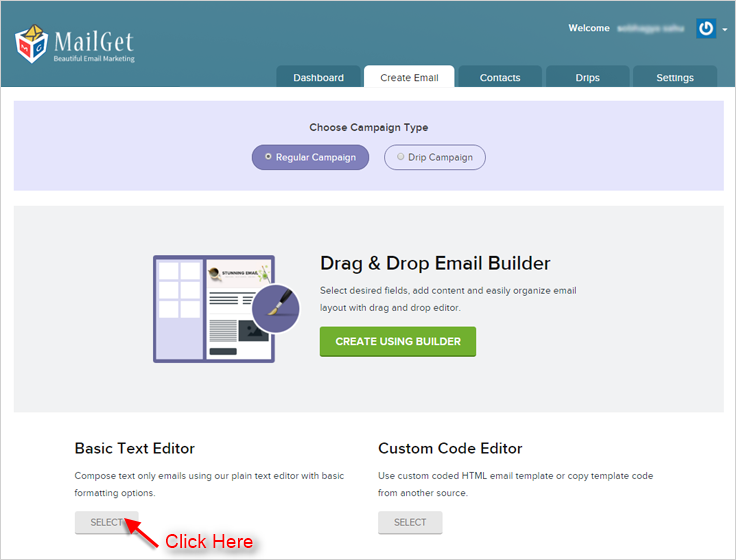 Select Drag and Drop Email Editor and you will move on to email builder panel. Click on sections to Add/Remove or to Drag & Drop field elements as per your requirement. If you want to Add More Fields to your email, you have options on the left side. Choose and insert what you want and where you want. Once you are done, click on Save & Continue button..
..proceed to send email tab. Follow previous steps from 1 to 3..
..reach onto email editor section. Check for Basic Text Editor from all the email editors and click on it. Then you will proceed towards the editor panel. This is the most Fundamental Editor one where you can create email within seconds. You just need to write your content in the space provided. With all that, you will find some great Editing Options at the top of this email editor. Finally, click on SAVE & CONTINUE button and move on to email sending section. 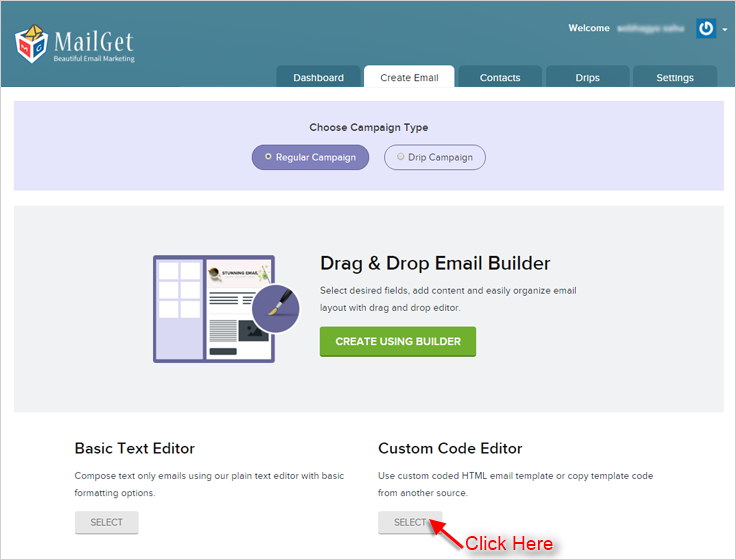 Other than providing two good email creator..
..MailGet also comprises of Custom Code Editor keeping in mind of HTML lovers. Through this email editor, you can directly go for creating your custom coded emails. You just need to write HTML Code in the editor. You can also check how your email looks by using Email Inbox Preview feature, just by clicking on Preview Button present on the top right corner. 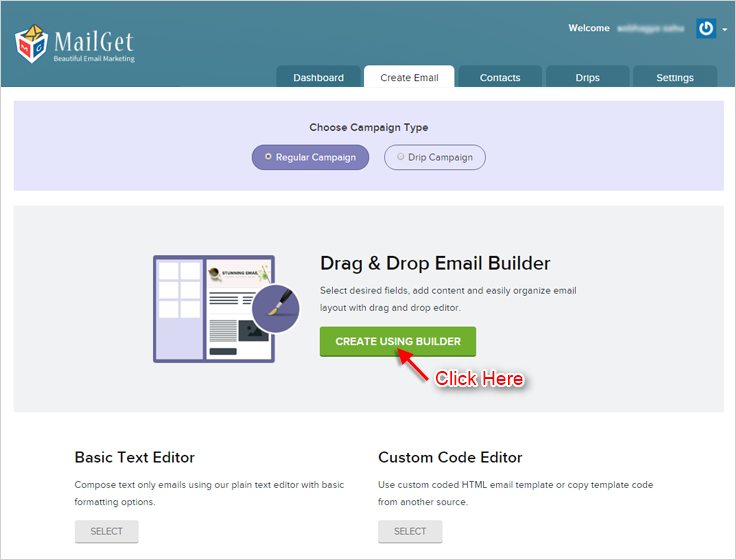 Along with this, you can also use Premailer HTML email template builder in MailGet. Other than providing responsive email template builders, MailGet is equipped with all the necessary and relevant features for successful email marketing and thus promises to achieve higher ROI for you than with any other service. 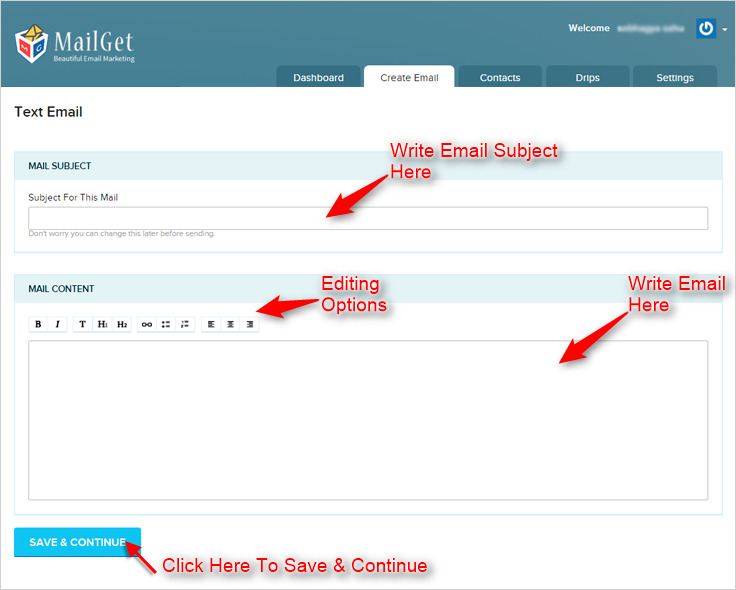 MailGet – email service provider… Only here you can have the real joy of Email Sending. It is Fresh, it is Easy, and it is Awesome..!! 1. When I actually go into Amazon’s console, it looks like only 1 of the 200 emails that it did let me sent actually went through. Which seemed weird. Should have went to all 200, no? The stats say 0 have opened it… So I’m guessing Amazon is right about it only sending to 1. 2. I noticed an area in the SES console that says “To send email through Amazon SES using SMTP, you must create SMTP credentials. SMTP credentials are a username and password that you use when you connect to the Amazon SES SMTP endpoint. You can use the same set of SMTP credentials for all regions in which Amazon SES is available. So is that something I have to do? When you initially apply to get the Amazon SES account, Amazon gives you the testing access of 200 emails per day. During testing access, you can only send emails to the emails that you have verified inside Amazon SES account. This means even if you are sending to 200 emails and if those emails are not verified inside Amazon SES, the emails will not go through. The best way here is to apply for production access from within the Amazon SES console and as soon your application is approved, you can start to send emails to any of your contacts. I did all the Things in Your setup tutorial. Applied for the Production Access and got approved, but still I have quota of only 200 and only 1 wmail is sent whats wrong??? I just saw your account and it looks like that you were finally able to send emails to all your subscribers. Incase you have any questions feel free to message us through the link below. How do we change the unsubscribe immediately to “manage your subscriptions”? Thnaks for reaching out here are my questuons. Ive done this for 12 years..
2 do you have drap and drop email templates? 3 can I mail my list 3 x a month 180k total how much? Opt-In questions first. 1. How did all of the people on your lists sign up to receive mail? Ive had my private practice for 12 years. My emails come from over 40,000 clients,direct mail pieces and people who were refereed to my newsletters etc. I am not currently using a website but when I have time I plan to construct one. If they signed up on the web, please provide a link to the sign-up form they used. 2. How old are the lists within your account? My list varies as new subscribers join but at a slower rate since I dont really actively advertise now. Most new people are new clients who come to me and when they fill out my questionnaire we ask if they would like to join our email list for special promotions or updates only from me. 4.If you have mailed to these lists through a different service provider, have all of the previous bounces and unsubscribes been removed? 1. When using the Custom Code Editor, how can I upload images? 2 Are there shortcodes available for use in the Custom Code Editor? Things like “view in browser” and “unsubscribe” links. 2. When using the drag & drop builder, is there a way to access the css and the html?